‘Spot the Difference’ competition regulars will keenly see the change in the cab design of the new Mercedes-Benz Actros, which received its world premiere in Berlin. For the first time ever in a heavy duty truck, external mirrors are replaced by camera lenses, which immediately reduces the wind drag effect. 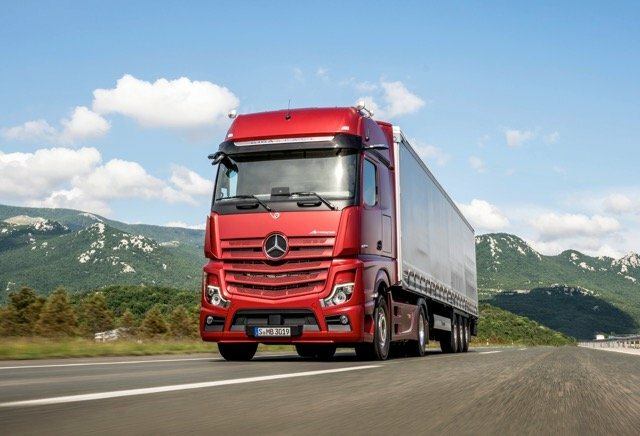 Numerous other innovations have been developed and installed in the new generation flagship truck model from the Daimler Group. “With more than 60 innovations, the new Actros brings the future of heavy-duty trucks to the roads today,”stated Stefan Buchner, Head of Mercedes-Benz Trucks at the start of his presentation. Mercedes-Benz Trucks is bringing semi-automated driving to series production: the new Active Drive Assist can brake, accelerate and steer. The system offers semi-automated driving at all speed ranges, not just some. The fuel consumption of the new Actros has once again been reduced compared to previous models and it achieves savings of up to three percent on motorways and as much as five percent on rural routes. Aerodynamic improvements have been achieved thanks to MirrorCam and new cab side deflectors. Predictive Powertrain Control (PPC), an intelligent cruise control, works considerably more efficiently than before and can now be used on rural routes, too, thanks to additional map data. New, fuel-saving rear axle ratios are also being deployed. The main mirrors and wide-angle mirrors have been replaced on the new Actros by the MirrorCam as part of the standard equipment. The MirrorCam represents a tremendous improvement in terms of aerodynamics, safety and vehicle handling. This system provides a significantly improved all-round view and consists of two cameras mounted to the exterior of the vehicle and two 15-inch displays on the A-pillars inside the cab. Active Brake Assist 5 supports the driver in case of a potential rear-end collision or a collision with another vehicle which is crossing in front of the vehicle, coming towards it or staying in the same lane – if required initiating maximum full braking to standstill automatically. As of now Active Brake Assist 5 works with a combination of a radar and camera system. This enables the system to monitor the space in front of the vehicle even better and respond to people even more effectively. All assistance systems in all Mercedes-Benz vehicles work within system limits at all times to their full capacity. The driver retains full responsibility with respect to the road and traffic conditions. The new Actros with its fully updated Multimedia Cockpit offers the driver a unique level of operational convenience and display comfort. Two interactive screens as standard serve as the central source of information in the driver’s digital cockpit of the future. Assistance systems are visualised here, as well as all basic information which is relevant to the driver. Connectivity is now reality in the Actros: smartphones can be connected via Apple CarPlay or Android Auto. Apps help the driver to fulfil his/her transportation tasks. The Truck Data Centre connects the truck permanently to the cloud and forms the basis of all connectivity solutions. Real-time monitoring of the truck via FleetBoard and Mercedes-Benz Uptime brings added value for the business owner. The driver also enjoys greater ease of operation thanks to the new remote-control key provided as standard. The development of the new Actros’ interior design revolves around the driver – working from the “inside out” as a principle. The result is a new “user experience” for the driver with new Multimedia Cockpit, which takes the Actros to the digital age. Touch functionality, the widescreen format for the displays, as well as details of the surfaces, trim elements and the few remaining analogue switches, are all hallmarks of the modern, high-quality interior of the new range topper wearing the Mercedes-Benz badge.